Ditch Witch has updated its water management systems to improve efficiency in horizontal drilling operations. The full line of fluid management systems includes the FT5, FM5X, FM13X and FM25X to meet the needs of any small- to mid-sized HDD project. The systems are equipped with tanks ranging from 200-gallon capacity to 950-gallon capacity, as well as powerful engines that supply up to 25 hp, depending on the model. "Fluid management is a critical part of the HDD process," said Cory Maker, Ditch Witch product manager, drill pipe and fluid systems. "Helping operators not only meet safety regulations, but increase productivity and yield, our updated line of fluid management systems set the standards for fluid management throughout the industry." The FM5X, FM13X and FM25X models feature an updated, internal venturi design that optimizes fluid velocity and increases overall system productivity. Additionally, a new, wet hopper design increases the venturi inlet from 1.25 to 2-inches - a 60 percent larger opening for material flow and superior fluid mixing. The tank on these units is designed with a sloping bottom to ensure all drilling fluid flows through the pump and is thoroughly mixed. A powder-coat finish provides durability, and helps with chipping, rust, and fading resistance for a longer useful life. 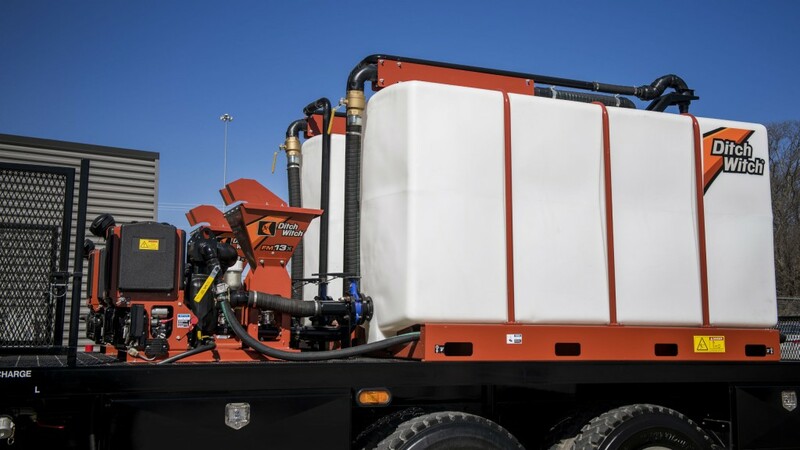 The FM25X system features multiple configuration options - including curbside and street side - to accommodate a variety of setups for easier transport, and offers fuel configurations from both sides of the unit to meet any jobsite need. The model utilizes a hydraulic circuit, providing operators the ability to run two tank systems simultaneously. By mixing one tank while a drill on-site is using mud from the other tank, the unit eliminates the need to stop a bore to mix fluid, further enhancing productivity and increasing uptime.